New phone means new camera means seeing all my flaws… In high definition! Still plodding along with the mini body double. 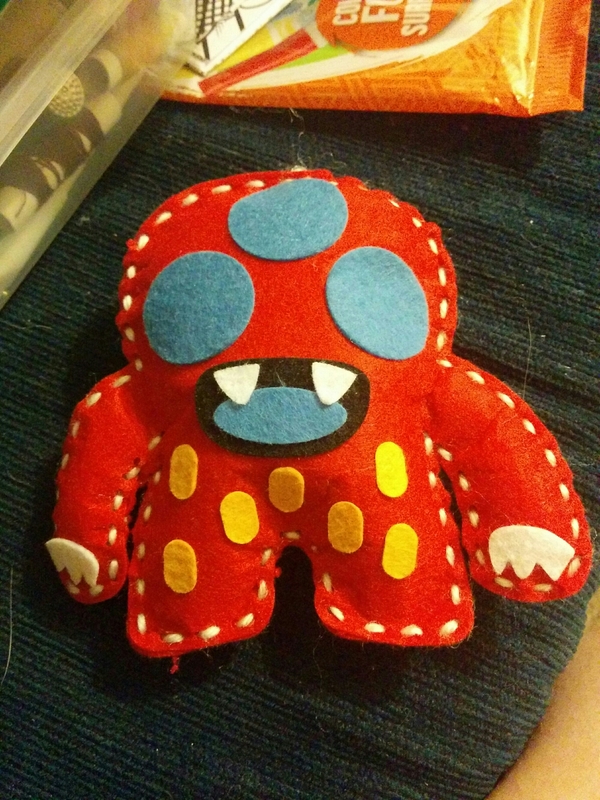 Instead of sewing the felt on, I somehow came to the conclusion of needle felting it on. As fun as this is, it’s time consuming and getting a bit annoying. Luckily there’s not much more to do, only patching up all the dart cuts I had to make to get the flat thing to cover the bumpy thing. Staring at green felt hasn’t been this fun since playing pool, without either of us being able to play well. So, many lovely pictures will be brought to you all, if I ever stop taking photos of my cats. I put the little hat in the wash. Looks like it wasn’t wooly enough, and didn’t change a whole lot. 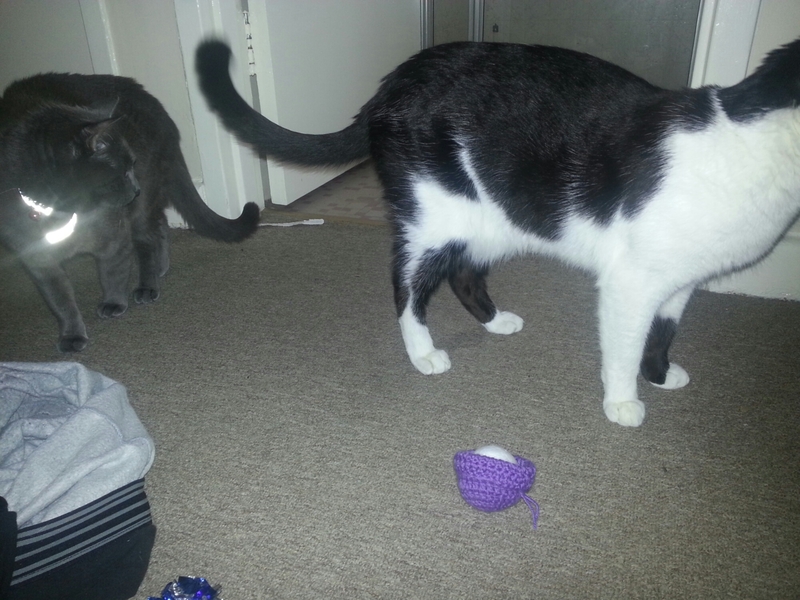 Not long after I put the hat on a ball to dry, my lovely, inquisitive, stealy, annoying cat stole it. It was kinda cute, as he picked it up in his mouth as I followed him with the camera for proof. Once I retrieved it and put it back on my table out of harms way, it didn’t take long for him to return to the scene of the crime for another attempt at thievery. Apparently, tiny wet hats are a cats best friend. 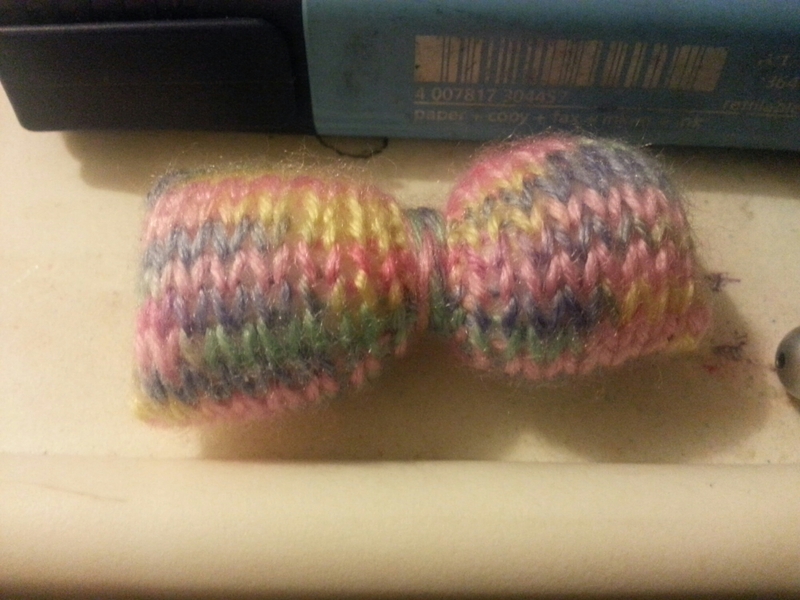 One of my recent internet browsing sessions brought me to an image of a lovely set of bows, basic and made of felt. What made these bows different to other bows was the mini buckle on each of the centre strips. The ones in the picture were round and silver, but I knew I had some square, gold buckles that needed to be put to use, so I tried it out. I was playing around, and came up with a nice red, white and gold theme. The tulle I used is more an orange-red than the felt, and probably brings down the elegance factor. But, hey, how elegant can you get using felt? I imagine a lovely off white, large soft satin bow would be lovely. I’ll have to dig my way down to my material box, and see what I have. I’ve been dying to get out my wonderful sewing machine lately. I know I have some pajama pants waiting to be made, among plenty of other things. As for the little beanie, it’s made of merino wool, as far as I can remember. I keep all my yarn labels, along with a length of every wool I buy. Only problem is looking through all the labels which have found themselves in plenty of different boxes. So, I’m hoping it’s a high enough percentage of wool, as I made it as a small test to try out machine felting. 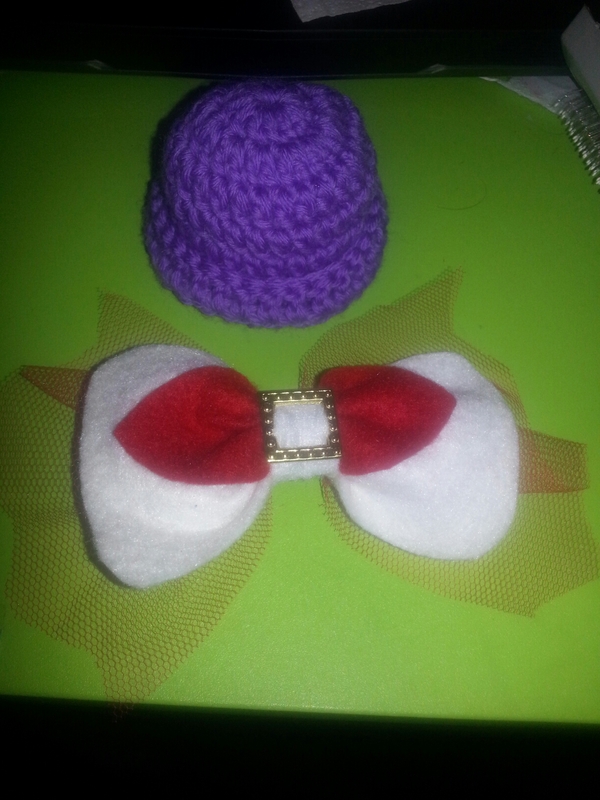 The hat was actually a simple pattern for a micro-preemie baby. If I got the ply right, and my tension, then there are babies heads out there that small, and that’s so tiny. Here’s the pattern for the hat. It can also be found on Ravelry. Not much to report, today. I tried to see how nice I could get the felting, but it’s all uneven by feel. It looks ok, except where the white of the under stuffing peeks through, but I think that means I just need to add more red. I used the red wool roving for this, to see how it felt (heh heh heh.) I think it will take some practice, so I might use the felt sheeting after all, as it turns out more even with less effort. I also cut up some layering paper with the bright new paper pack that I bought. This means I made random rectangular shapes that will fit on a card, so I can mix and match and get ideas without having to cut the corner off a large sheet. Useful for throwing together lots of cards, or making cards in a hurry. To further aid this issue, I’ve learnt that some crafter’s have a box of stamped images that they colour when they’re not so busy, and they have a box full of pre-stamped, and pre-coloured images ready to be matched with pre-cut layers and pre-printed sentiments to put on their pre-folded cards. Organisation is awesome. If I’ll only ever get around to it. 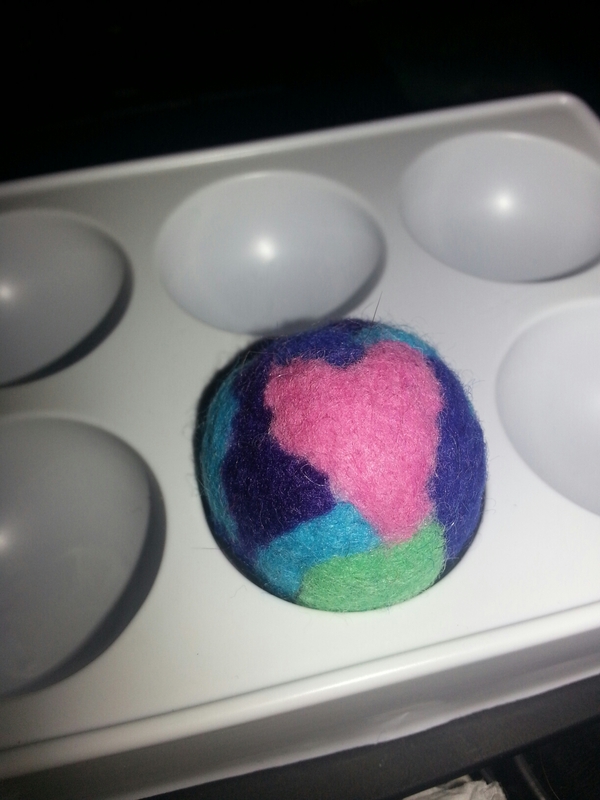 I wanted to try something for my needle felted doll, so I tried out the technique by making a small ball. I tried making a larger ball, but I didn’t do it right, and had to start smaller. 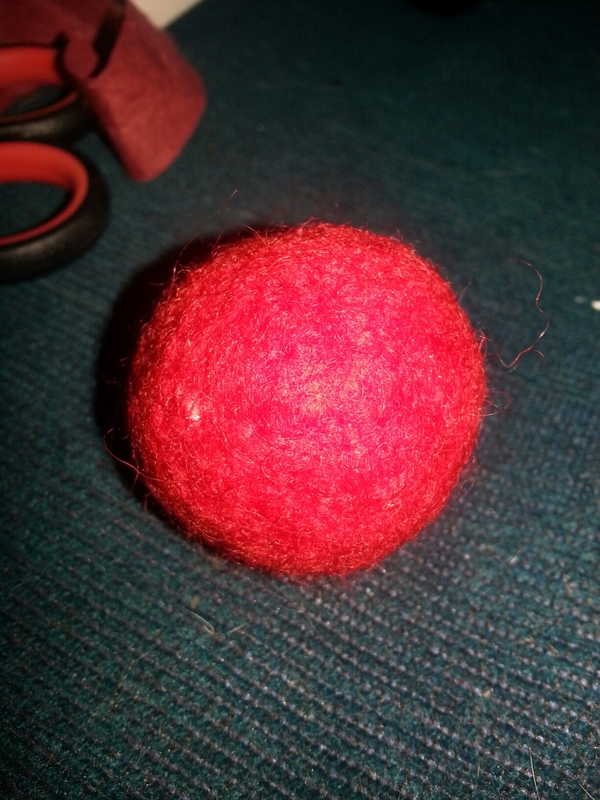 I made a base ball with polyester filling, then raided my felt sheet scraps and needle felted them on. It worked out well, and the heart shape hole was actually a coincidence, left after piecing randomly, so I filled it in in pink. I definitely need to invest in a tool, so I can use more than one or two needles. It takes such a long time. It took me two and a half to make this and the mistake ball. It’s a bit tough to pierce the flat felt, as it’s already tightly compacted, but with a bit of work, it all lays nice and flat. This will come in handy when applying to the doll. I’ll probably felt the skin right on, then make removable clothing. Years of dressing barbie dolls should help with that part. Beginning to fluff my armature. 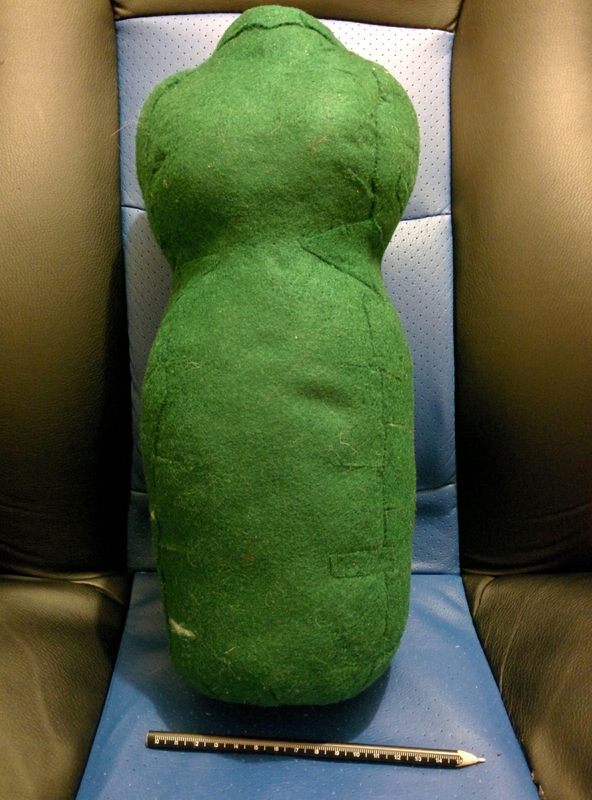 Just using polyester filling and blocking in the shape, slowly. It’s quite fun, despite being repetitive and risky, but I don’t mind menial tasks occasionally, and there have been no puncture wounds, yet. I’m not packing the stuffing too tight, as I’m not sure how to pose the doll/figure, and there’s room to change the proportion if it’s off. I can usually eyeball the figures proportions, but that’s usually with the skin on, and on paper. 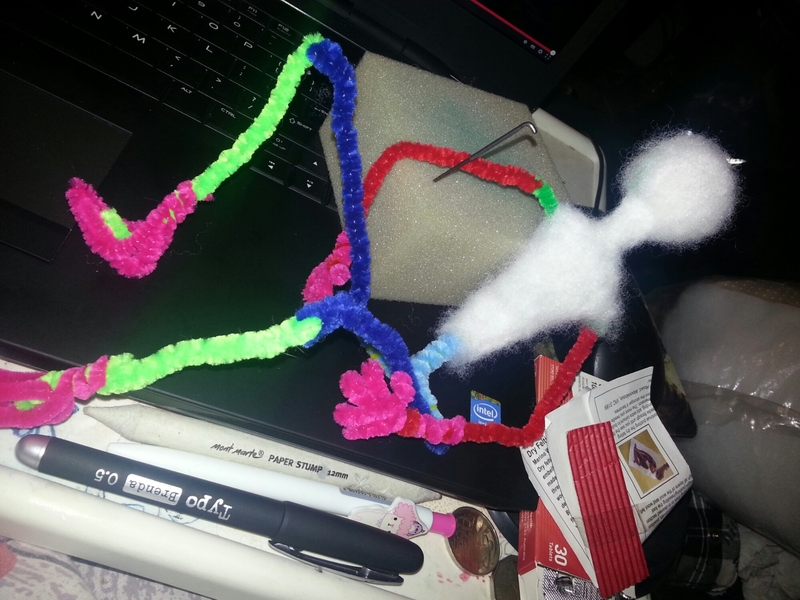 Pipe cleaner bones are a bit bendy and tricky to approximate. Of course, I could have measured, but where’s the fun in that? Besides, dolls hardly ever have realistic proportions! I’m going to try covering the stuffing later with felt sheeting for skin. Hopefully, I can cut darts into it to make it fit without much bulk, but sculpting features as I go. I have no idea how I’ll do the hands. She was going to be a fantasy character, so she’ll probably be wearing some gloves. Hopefully, that will make it easier. Remember how I said I like a challenge… Or the time I always bite off more than I can chew for a beginner. Today was an interesting day with crafts. Such as colouring in a money box car with red marker and paint over it with red glitter, only to have the marker ink reactivate and make an exact blood red. Then I tried to glue rhinestones to a bear money box, only to have them slide down the face slowly because the glue somehow got watery with the heat. Next was making roses with dictionary paper from a book I got at the thrift store the other day, and the pages were so thin that I had to paint glue over them, just so I could bend the petals properly. So they don’t look nearly as good as I’d hoped. Finally, I was bored and decided to play around with felt. Basically, I flicked through my craft folder of pictures on my computer, and made things inspired by the pictures. 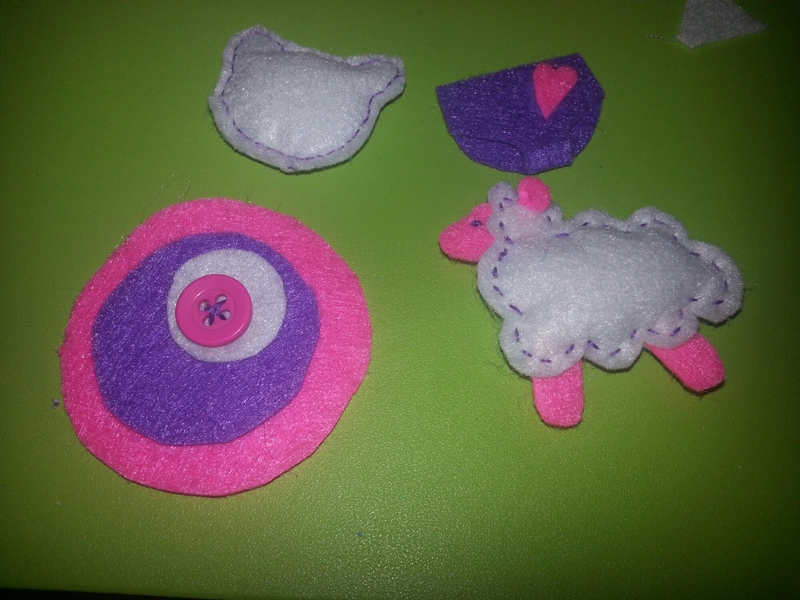 The sheep was a finger puppet, the circles were flower shapes, the cat was a keyring, and the underwear… was on a bear. A little clay one. None of the colours are the same, apart from the sheeps coat. In other news, I found my iron, so if I don’t melt, I might get some sewing done. Mind you, everything is a mess, I’ve been crafting in three separate rooms to save cleaning up. I really should get on that.